The Buddha in His 80th year reached Kusinara (Kushinagar) from Gijjakuta (Rajagaha) for the final passing away (Mahaparinirvana). Venerable Ananda, the Chief Attendant of the Buddha asked the Buddha, "How should one treat the Perfect One's remains?" The Buddha replied that the remains of a Universal Monarch (Cakravarti) are enshrined and monuments built at the four crossroad. The Perfect One's remains too should be treated similarly. The Perfect One's monument should be built at the four crossroad; and wherever shall put flowers, or scents on it, or whitewash it, or shall worship it, or feel confidence in His heart there, that will be long for His welfare and happiness". Thus Buddha sanctified the worship of His Sacred Relics. The Relics were distributed among eight kings by Brahamin Dona and the Moriyans who came late had to be satisfied with the ashes of the fire and Dona took to himself the measure with which he apportioned the Relics. They all built Stupas enshrine the Sacred Relics, ashes and the measure. 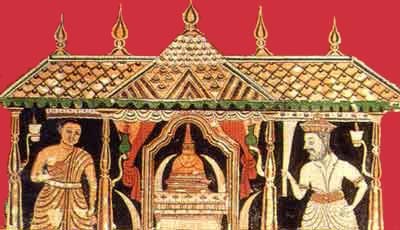 The Sacred Tooth Relic was not enshrined but held by some king or other which is not recorded and was venerated in India. During the reign of Siri Moghavanna of Sri Lanka (in his ninth reigonal year), there were internal strife in Kalingadesha of India (modern Orissa) and the left-eye Tooth Relic of the Buddha (Vamadhata Dhatu) was in Dantapura of Kalinga. In order to ensure the Sacred Tooth Relic's safety Prince Danta and Princess Hemamali disguised themselves as wandering mendicants with the Trisula and water pots, and Hemamali concealing the Sacred Tooth Relic in the knot of her hair reached Sri Lanka. They knew that King Siri Meghavanna was a devout Buddhist had contacted the Indian emperor Samudragupta and had built a monastery at Buddhagaya for Sinhala pilgrims (Mahavamsa introduction, Geiger translation). There is still an inscription in Gupta scripts on the stone railing of Buddhagaya testifying to the building of the monastery. On the arrival of the Sacred Tooth Relic, instead of the Sri Maha Bodhi as the palladium of the Sinhala kingship, this role devolved on the Sacred Tooth Relic, as it was a moveable object. Therefore in times of internal conflicts to the throne, there were claimants to the Tooth Relic among the feuding princes. As Abhayagiri Vihara had a Mahayanic bent and advocated the Veneration of Relics, from very beginning, The Relic was associated with the Abhayagiri Vihara at Anuradhapura. According to the Mahavamsa of Sri Lanka and the Sasanavamsa (Buddha's dispensation) as found in Burma, in the third century B.C. (253 B.C. ), the Third Great Buddhist Council was convened by Emperor Asoka with his preceptor Venerable Maha Moggaliputta Tissa Thera at Pataliputra (modern Patna in India) and despatched on the conclusion of the Council, exactly ten years after the Council in 243 B.C., the Arahant Majjhantika to Gandhara and Kasmira. Arahant Majjhima to Cina-Himavanta (China and the Himalayan countries), Arahant Sona and Uttara to Suvannabhumi (Burma and other South East Asian countries), Arahant Mahinda to Sri Lanka, Arahant Mahadeva to Mahimsakamandala (modern Karnataka and the Deccan States of India), Arahant Maha Dhammarakkhita to Maharattha (modern Maharashtra and Madya Pradesh of India), Arahant Rakkhita to Vanavasi (southern part of India, Karnataka, Goa including Goa), and Arahant Yonaka (Greek) Dhammarakkhita to Aparanta (western India including modern Gujarat, Rajasthan and Pakistan). They were provided with erudite groups of monks too. These selections, were not done haphazardly but by unanimity of the members of the Council, as the Buddha, as recorded in Digha Nikaya 16; Anguttara Nikaya 7; 20, "Advised Bhikkhus", to assemble in concord, rise in concord and do their duty as members of the Sangha in concord. This was the format adopted in the First Great Council held at Sattaprani Caves at Rajagaha three months after the demise of the Buddha. The Third Council too adhered to this format. These Missionary Monks would have certainly been members of the Council and were duly guided in the tasks assigned to them. As regards Sri Lanka, Arahant Mahinda certainly adhered to the proclamations in the Rock, minor rock and pillar inscriptions of Asoka, his father. Asoka in 262 B.C. twelfth year of his reign, in the Girnar version of his Rock Edict 1 ‘in line two says.' But now, in consequence of the practice of Dharma on the part of the King Devanampriya Priyadarshin, the sound of drums has become the sound of Dharma, showing the people representations of aerial chariots, representations of elephants, masses of fire and other divine figures'. This clearly indicates Arhant Mahinda introduced the Indian tradition of processions to mark Buddhist religious festivals and ceremonies. Certainly he would have advised King Devanampiyatissa to arrange the ‘Kathinapura Perahera' on the conclusion of his vassa (‘rains' retreat) at Missakapabbata his first vassa in Sri Lanka. The Barbar Cave inscriptions of Asoka records the giving of Banyan Cave and a cave in Kahalatika Mountain to Ajivakas (Ajivakas are Thirankara ascetics, the followers of Jaina Mahavira (Niganthanathaputra) (Jainism). Arhant Mahinda would have introduced the tradition of donations of caves to Sangha, which are numerous in the island. Sutta preaching Pirit too was introduced a Minor rock Edict of Asoka of Calcutta - Bairat in line 5 requests Suttas to be preached and listened to. Arahant Mahinda introduced Pirit chanting ceremonies by the Bhikkhus. Laymen preaching Suttas is not sanctioned by the Buddha. In the Pillar Edict VII of Delhi - Topra Aoka summarising his works among other activities says, that he had banyan trees planted beside the roads to provide shade to cattle and men, planted mango trees, at intervals of eight wells were dug and flights of steps provided. These were like modern swimming pools or Kuttanpokuna of Anuradhapura. All these Indian tradition were introduced by Arahant Mahinda to Sri Lanka. Still some of the rest houses set up (ambalams) as was done in India too was introduced by Arahant Mahinda. These ambalams were places with water in plenty like streams and the building had a conical roof with pinnacle indicating it was owned by the king and village committee meetings were held in this ambalama with short walls providing seating accommodation for those assembling on the periphery of the building. 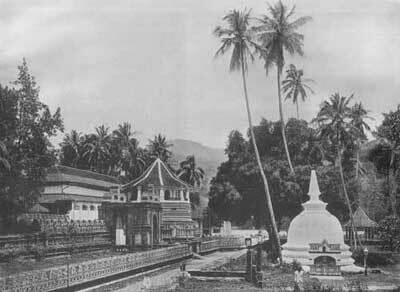 The most lucid account of the Sri Dalada Perahera is in the travel records of Chinese pilgrims Monk Fa-Hien, who visited Sri Lanka in the fifth century A.D. "Fa-Hien says "By the side of the King's Palace is the Vihara of the Buddha's Tooth, several hundred feet high, brilliant with jewellers and ornamented with rare gems. Above the Vihara is placed an upright pole on which is fixed a great padmaraja (ruby) jwell..... The Tooth of the Buddha was always brought forth in the middle of the third month. Ten days beforehand the king grandly caparisoned a large elephant on which he mounted a man dressed in royal robes, who could speak distinctly, and the man went round beating a large drum, describing the life and the virtues of the Buddha, and announcing to the public; ‘Behold, ten days after this, Buddha's Tooth will be brought forth, and taken to the Abhayagiri Vihara. Let all and each, whether monks or laymen, who wish to amass merit for themselves, make the road smooth and in good condition, grandly adorn lanes and by ways, and provide abundant store of flowers and in cense to be used as offerings to it." "When this proclamation was over, the king placed for exhibition on both sides of the road, the 500 different bodily forms in which the Buddha had appeared in his previous births according to the Jataka stories. All their figures were brightly coloured and grandly executed, looking as if they were alive. After this, the Tooth of the Buddha was brought forth, and was carried along in the middle of the road. Everywhere on the way offerings were presented to it, and thus it arrived at the hall of the Buddha in the Abhayagiri Vihara. There the Monks and the laity collected in crowds, burned incense, lighted lamps and performed all the prescribed services, day and night, without ceasing till 90 days had been completed, when the Tooth was returned to the Vihara within the city. On Poya Days, the Doors of the Vihara were opened, and forms of ceremonial reverence were observed according to the rules". (Fa-Hien Travel Records pp. 104, 105 - 107). Another Chinese pilgrims Monk Hiuen Tsiang, who did not visit Sri Lanka but, was in India studying at the famous Nalanda University for many years in the 7th century, from accounts he gathered from visitors from Sri Lanka to India says, "The King, three times a day, washes the Tooth of the Buddha with perfumed water, sometimes with powered perfumes. Whether washing or burning incense, the whole ceremony is attended with a service of the most precious jewels". (Hieun Tsiang Book XI P. 248). Incidentally King Mahasena's son, Siri Meghavanna, during whose reign the Tooth Relic was brought to Sri Lanka, inaugurated a new festival in honour of Arahant Mahinda. He had a life-size image of Mahinda made of gold and on the seventh day of the month of Vap (Pubbakattika, October - November) took it to Ambatthala at Mihintale where, the Thera had met with Devanampiyatissa, through a well decorated from Anuradhapura to Mihintale. On the ninth day of the month (two days after) in a mammoth procession of Monks and laymen and laywomen the image was taken to Sotthiyakara, a Vihara built by the king himself, near the eastern gate of the city. The image was kept at the Vihara for three days. The city was richly decorated. On the twelfth of the month, the image was taken in procession through the city to Maha Vihara, and it was exhibited for three months in the courtyard of the Maha Bodhi. Ultimately the image was placed in a specially built house in the South East direction in the precincts of the Royal Palace. The King had also built in that house images of Itthiya and other companions of Mahinda. King made endowments for the maintenance of the place and had decreed the festival be held annual. Venerable Dhammikitti, the author of the second section of the Mahavamsa (Culavamsa) says that kings from that time honoured the decree and held the Mahinda festival and processions and even in his day 13th century these were held. King Dhatusena too (460- 478 A.D.) held the Mahinda festival at which the recital and exposition of the Dipavamsa formed a special feature. There was a literature too formed based on the Tooth Relic. Dalada Poojavaliya is based on Pali Dhatavamsa and, in addition to it in the last chapter gives details of donations and endowments made to the Tooth Relic. The last king named is Parakramabahu IV. There had been a Sinhala work called Daladavamsa done during the time of King Aggabodhi I, during whose reign the twelve great poets flourished. This work is lost to us today along with several other Sinhala works. The Dalada Festival was held wherever the Kingdom was taken. 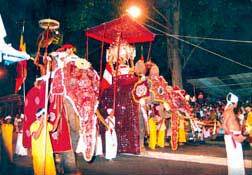 In Kandy, the Dalada perahera originated in 1754 A.D. The Siamese Upali Maha Thera (Thailand) who came to Sri Lanka with a chapter of highly ordained (Upasampada) Monks at the invitation of King Keerthi Sri Rajasinghe, on the initiative taken by Ven. Velivita Sri Saranankara (later Sangharaja) in 1753 to re-establish Upasampada in Sri Lanka, in the month of Esala heard the sounds of jinglers from Malwatu Vihara from towards the Dalada Maligawa. Having learnt it was the annual Hindu Satara Maha Devala Perahera, he made the King to understand that as Sri Lanka is a Buddhist country and Kandy with the re-establishment of Upasampada will become the nucleus of Buddhism in the country, to have a procession of the Dalada too made to parade the streets along with the Devala Peraheras giving the Dalada perahera priority in the order of the Perahera. Thus it was done in 1754. 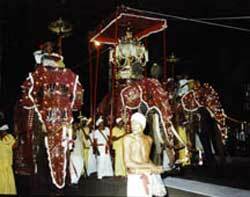 This is the first Dalada perahera of the Kandyan Kingdom.